Radio drama always interested me but until Pandora's Boxes I never had a chance to try my hand at it. The idea of expressing absolutely everything only in the medium of sound seemed fascinating but extremely challenging. Undoubtedly, Denise O'Leary's brilliant script, with its striking one liners, was a great help — it carried itself remarkably well on invisible but very powerful radio waves. I like modern plays that in some way retell ancient myths. Pandora's Boxes only echoes with the well known Greek legend, even though the heroine's name still is Pandora. 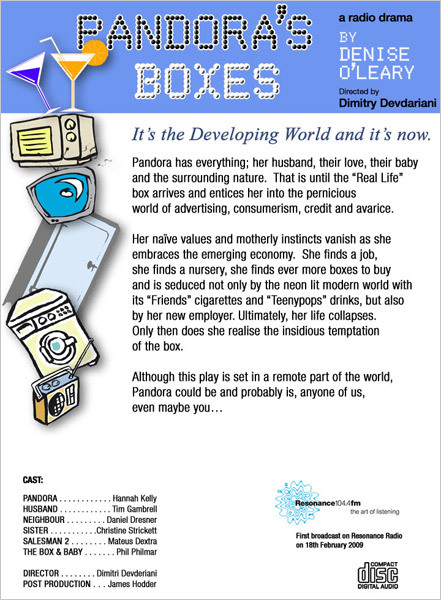 O'Leary's Pandora lives in a small village with her loving husband and adorable baby son. She is happy and content until one day her husband finds a mysterious box which turns out to be a TV set. Pandora's life within this idyllic family existance was so sheltered that she had never seen a TV set before; and once she turns 'the box' on her life changes forever. She starts to want more; she cuts her beautiful long hair; she becomes 'modern', finding a job in a shop that sells various 'boxes'... Pandora becomes a consumer! She starts to want more and more boxes, but her happiness, her family and her life fall apart. With the help of a brilliant cast and very creative staff at Resonance Radio, Denise O'Leary's fairy tale for adults came together quickly and easily. I enjoyed this project enormously and I do hope to return to this play again, but this time perhaps as a stage version.